There are larger scans of many of the earlier cars up as well-- harkening back to the days before lots of bandwidth. These are several times actual size at least and will appear in a pop-up window. MTL Catalog Number 38170, 1991 Holiday Car "Stockings". Approximate New In Box Value: $15-20. The 1991 holiday car had a one time only feature that has grown on me over time. The roof and ends are sprayed with an automobile enamel-like metallic finish; in fact, it may be exactly that. This gives a real holiday "sparkle" to the car... cool! While the Micro-Mouse, in his first appearance, peers out of the middle stocking, the other stockings hold an F-unit diesel and center cupola caboose, respectively. Hmmm... those must have been Z Scale! (Actually, Micro-Trains didn't release a Z Scale Christmas car in 1991.) The legend on the plug door reads, "Close and Lock Door After Delivering All Micro-Trains Products." The 1992 car featured a takeoff on Jingle Bells that didn't quite have the same poetic meter as the song does, but so what. A takeoff on "Where's Waldo" might have also been perceived, as it's real hard to pick that Micro-Mouse out of all the gifts on the MTL sleigh. (Look directly below the "ee" in Greetings... should not "ee" be associated with a mouse?!?) The colored door hardware was just coming on line during this time and for the ocassion, it's in green instead of the usual black. There was no Z Scale car in 1992. 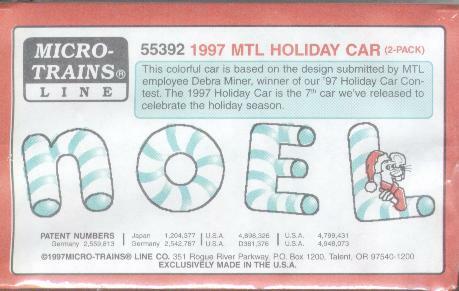 MTL Catalog Number 37020, 1993 Holiday Car "Under the Tree". 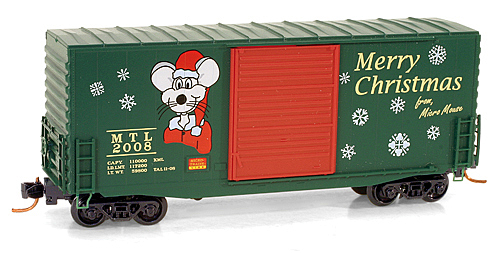 For 1993, we got two Micro-Mice, one "Dreaming of a Micro-Trains Christmas" and the other, apparently the "dream" M-M, sitting in a gondola being pulled by that F-unit and attached to a center cupola caboose. For the first time, the MTL employee design contest is mentioned on the label's car copy, and not only is the 1993 winner named, so are the '92 and '91 winners. Who are they? Well, that would make a great trivia question, wouldn't it? 1993 was also the first year that a Z Scale car was produced. The same design was done on the same car (13715/506 00 150, $18.40 with Marklin Couplers and $20.05 with Magne-Matic Couplers). I don't have an image available for it at the moment. 1994 Holiday Car "Santa Chimney". Approximate New In Box Value: $20-25. Center Flow® covered hoppers were still pretty new to MTL in 1994 when this Holiday Car was released. The Micro-Mouse plays "Santa's Helper" and the caption at the bottom right reads "Notice: Open Chimney Hatches Santa Is Bringing Micro-Trains For All!" This car took a looooong time to sell out-- it didn't hit the bye-bye board until several years passed. But that was the last time that occurred, at least up to this point. The Z Scale version of this car was done on a 40 foot plug door boxcar (14914/502 00 140, $16.40 with Marklin Couplers, $18.05 with Micro-Trains Couplers). 1995 Holiday Car "Holly Jolly Christmas". Approximate New In Box Value: $40-50. This 1995 release is the key car in the set. Widely rumored to be a short run, this car was in and out in a flash and caught many people off guard. As such, it's consistently garnered prices in the range cited above, regardless of the auction venue (on-line or paper based) and regardless of whether we like it or not! (It's been in the $100 range previously, though.) It also set off a bit of a run on the previous holiday cars which sopped up most of the remaining pieces of those earlier productions. The Z Scale version of this car was done on a steel Center Cupola caboose (14713/535 00 130, $18.75 with Marklin Couplers, $20.40 with Magne-Matic Couplers) being that there was no direct equivalent for the 51000 offset cupola body style in Z. Different cars in N and Z has been the case more often than not in the Holiday series. 1996 Holiday Car "Santa's Train". Back to normal in 1996 when there were plenty of copies of this box car available. The green door sets off the all aluminum car... well, I prefer to call it "silver", it's a little more holiday-like. The Micro-Mouse is hangin' out under the MTL logo. Not much lettering or dimensional data on this one, basically just the "MTL 6" designating this as the sixth release in the Holiday Series. In Z Scale, this car went straight over to the same box car body style. The Z Scale release was also done on a 40 foot boxcar (14133/500 00 330, $17.75 with Marklin Couplers, $19.40 with Magne-Matic Couplers). 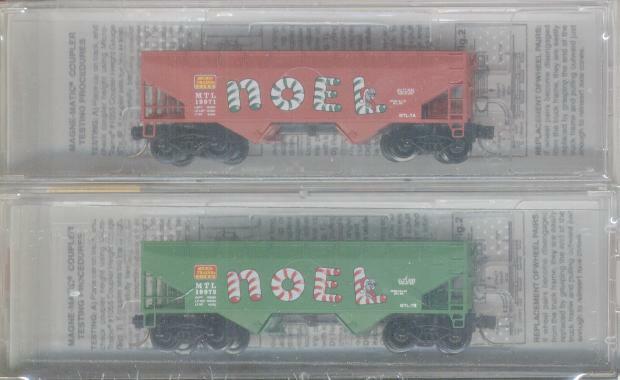 MTL Catalog Number 55352, 1997 Holiday Two-Pack "Noel". Approximate New In Box Value: $35 (i.e. roughly the original price). Something a little different for 1997: a two-pack in a bright red and green. (You know, city streetlights, even stoplights, blink those same colors. Sorry.) The candy canes are in offsetting color stripes... green on the red car, "MTL 7A" or road number 19971, and red on the green car, "MTL 7B" or road number 19972. The Z Scale cars were 40 foot gondolas, a now-obsolete body style no longer made by MTL (14312, $29.00 with Marklin Couplers, $32.35 with Magne-Matic Couplers), and I'll bet it was a challenge to print that 1:220 "NOEL" in between the ribs of those gons. MTL Catalog Number 102060, 1998 Holiday Car "Snowball Express". Approximate New In Box Value: $18-$20 (i.e. roughly the original price). When released in 1998, this "Snowball Express" instantly became my favorite Holiday Car... at least up to that point. Maybe it's my partiality to blue, or maybe it's my traditional view that there should be some snow for the holidays. And it could also be the choice of the 102000 series 60 foot boxcar body style, which to me just seems impressive all by itself. With the release of the two pack in '97, the release count and the car count diverge; the legend on the car reads "MTL 8" but this is actually the ninth Holiday Car. The Z Scale version was done on a 50 foot plug door boxcar (13620/507 00 200, $17.75 with Marklin Couplers, $19.40 with Magne-Matic Couplers). 1999 Holiday Car "Holiday Cheer". Approximate New In Box Value: $20-$23 (i.e. roughly the original price). The Z Scale version of this release was also on a tank car (14418/530 00 180, $16.10 with Marklin Couplers, $17.75 with Magne-Matic Couplers). MTL Catalog Number 69100, Pepsi-Cola® Holiday Car, Released 1999. Approximate New In Box Value: No consistent premium above original price established. Hmm... guess I have to include this 3rd car in the Pepsi-Cola Special Edition Series, given that it is officially dubbed a "Holiday Car" by MTL. Santa appears prominently just as he had in numerous Pepsi-Cola advertisements of the past. Anything to get consumers drinking a cold soft drink in the middle of the winter! Anyway, this doesn't count in my unofficial listing of the MTL Holiday Series, but hey, why not throw it in anyway. 2000 Holiday Car "Light Up The Night". Approximate New In Box Value: $22-$25 (i.e. roughly the original price). No question about it... this 2000 release is my favorite Holiday Car, and one of my all time favorites across the entire spectrum of over 1000 different Micro-Trains releases. There's something about it that just says, "Class." Here's the Z Scale version of this car, done on the 50 foot plug door body style (Catalog Number 13621/13621-2). It's in our accumulation... actually, it's in Thalia's accumulation, as this was a gift to her in honor of her birth year. Doesn't look like MTL missed a beat in reducing the artwork from 1:160 to 1:220. Also from 2000: Surprise! A bonus N Scale Holiday Caboose. (It wasn't done in Z Scale.) I don't know specifically whether this was to enable MTL Holiday Car operators to have a "proper" end of train without having to hit the collector market for the 1995 car, but it sure would have been a nice gesture if so. (Remember that MTL doesn't get a cut of any of the premium prices once the cars leave the factory!) This is a much plainer car, though, and not a Micro-Mouse to be found. Another curious thing... recall above how the two 1997 hoppers carried an "A" and "B" designation? You'd think that either the "Light Up the Night" refrigerator or this caboose would carry an "MTL 10A" and the other would be "MTL 10B"... but they are both printed with "MTL 10B!" Unless I have a rare error or something. 2001 Holiday Car "Santa's Coal". Naughty or nice? You'd better watch out... For 2001 comes the 11th year Holiday Car, but the 14th release overall. We've got a pretty long train here starting from back in 1991! In Z Scale, this was done on a 50 foot gondola (13103/522 00 030, $15.95 with Marklin Couplers, $17.65 with Magne-Matic Couplers). 2002 Holiday Car "Holiday Transportation Company". The 2002 Edition brings back the Micro-Mouse who'd been absent since 1998. The trailer has a red ribbon that wraps from the front end over the top and down the back end, topped with a green and white bow... certainly the first time that's ever been done on an MTL item. Here's a view of the top of the trailer. Z Scalers needed to settle for a 50 foot plug door boxcar (13622/507 00 220, $23.75 with Marklin Couplers, $25.45 with Magne-Matic Couplers), also the first release on the 13600/507 body style since the 2000 Holiday Car. 2003 Holiday Car "Happy Holidays". The 2003 Holiday Car which closed out the series--until 2008 that is-- featured a "snow accumulation"-- we at UMTRR HQ can identify with that!-- and also some snowpersons, including, we think, the Micro-Mouse. In the "true trivia" department, this is also the second MTL Holiday Release to come with the extra low profile wheels (the 2002 TOFC set was first). In Z Scale, this release was again on a 50 foot plug door boxcar (13625/507 00 250, $27.50 with Marklin Couplers, $29.30 with Magne-Matic Couplers). Christmas In 2004, MTL began a new series, the "Twelve Days of Christmas" in both N and Z Scales, which was scheduled to run from 2004 through 2007 with three "days" cars per year. MTL also released Christmas tree ornaments that matched the cars. In 2005, an FT-A locomotive (an F-7 in Z Scale) and caboose were issued. In 2007, a B-Unit in N and Z Scales was released, as well as a second number of the FT-A Unit in N Scale (not pictured here). 2008 Holiday Car "Merry Christmas from Micro-Mouse". In 2008, the Holiday Car tradition returned, and so did the Micro-Mouse! As in previous years, it was necessary to use two different body styles for the different scales. The series appears to remain as popular as ever, with the Z Scale version selling out in the month it was released. 2009 Holiday Car "Merry Christmas" ("Slope Shredder"). The Micro-Mouse rode down through the snow in a "slope shredder" (actually, just a sneaker!) on the 2009 edition of the Holiday Car. The legend, "Merry Christmas from Micro-Mouse" was almost exactly the same as it was on the 2008 release, so what's a documentor to do to distinguish one release from another? Bring images, of course! For some variety, and also to have something to pull all those Holiday Cars, MTL released a pair of "Merry Christmas" locomotives. In N Scale was the FT-A and in Z Scale the GP-9. The N Scale diesel allows enough space on the side for a short train, but the Z Scale Geep's long hood has only enough room for a locomotive. Of course, the engineer on both of these is none other than Micro-Mouse. 2011 Holiday Cars "Merry Christmas Sign Painter". 2011 Holiday Cars "Bah Humbug". MTL Catalog Number 101 00 720, 2012 Holiday Car "Micro-Mouse and Mistletoe". Using the same modified Hy-Cube Boxcar body style developed for its Smithsonian Civil War Special Edition Series, Micro-Trains released this car. On one side, the Micro-Mouse is getting a kiss under the mistletoe from an unnamed female mouse. The "B" side includes a holiday greeting. There was no Z Scale Holiday Car in 2012. MTL Catalog Number 021 00 540, 'Happy Hanukkah' Car. In addition to the usual Christmas cars, Micro-Trains also released via pre-order this Hanukkah Car. It was made with translucent plastic for a "stained glass" look. MTL Catalog Number 101 00 730, 2013 Holiday Car "Micro-Mouse / Candy Cane". Approximate New In Box Value: No consistent premium above original price established. 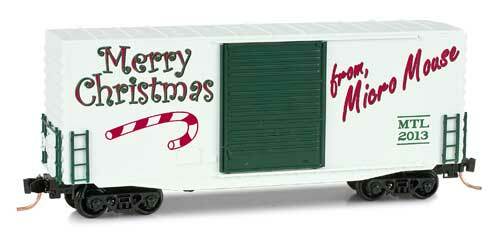 As in 2012, MTL used its modified Hy-Cube Boxcar body style for its N Scale Holiday Car. This time, Micro-Mouse is chewing on a (rather large!) candy cane on one side, and there's a holiday greeting on the "B" side. The Z Scale car (502 00 270, $23.95) used the same general design on a 40 Foot Plug Door Boxcar. MTL Catalog Number 021 00 560, 'Happy Hanukkah' Car. MTL also released a second N Scale Hanukkah Car in 2013. For 2014, MTL was busy! A "Vintage Postcard" series was started, with a projected three releases per year for 2014, 2015 and 2016. The "A" side of these cars (shown here) were based on actual postcards popular in the early part of the 20th Century. You might say postcards were the Twitter of that time period: the fastest way to communicate a short message! There was a short Holiday Message on the "B" side of each of these cars. As in the two previous years, the modified "Hy-Cube" boxcar was used for these releases. MTL Catalog Number 101 00 811, Postcard Series #1 "Santa Car". MTL Catalog Number 101 00 812, Postcard Series #2 "Santa On The Line". MTL Catalog Number 101 00 813, Postcard Series #3 "Santa's Balloons". MTL Catalog Number 101 00 801, Custom Postcard. Approximate New In Box Value: Not applicable. In my pre-review of the Vintage Postcard series in the UMTRR, I asked, "What if modelers could fill out their own postcards with a personal holiday message?" And they were able to with this additional release, which was custom ordered through the MTL factory only. The "A" side looked like this and the "B" side varied by car (!) but looked more or less like this MTL artwork. An aftermarket price doesn't really make sense here since every car was a custom run. I guess you could say they are "priceless." MTL Catalog Number 038 44 200, Burlington Northern Weathered/Graffiti "Merry Christmas". "But what of the Micro-Mouse?" you might be asking. Well, in a complete surprise release, the Micro-Trains mascot did appear on a mid-month Weathered/Graffiti release. The colorful, intricate decoration was heavily based on a New York Subway car. This design also appeared in Z Scale on one of the two cars in a Soo Line Weathered/Graffiti Two-Pack (551 44 180, $64.95). However, there was no "traditional" Z Scale Holiday Car for 2014. In 2015, Micro-Trains released the middle three cars in the "Vintage Postcard" series. MTL Catalog Number 101 00 814, Postcard Series #4 "Winter Stroll". MTL Catalog Number 101 00 815, Postcard Series #5 "All Aboard". MTL Catalog Number 101 00 816, Postcard Series #6 "Santa Claus". MTL Catalog Number 101 00 802, Custom Postcard. Original Price: $39.95, Released December 2015. 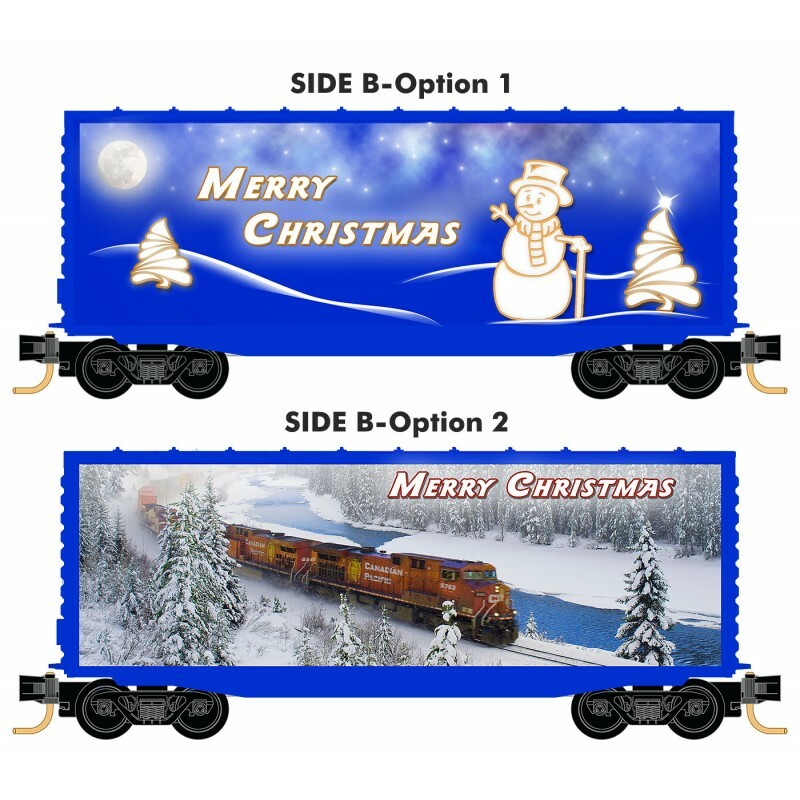 MTL also issued a second Custom Christmas Car, this time with a choice of three different scenes for the 'A' side and a common 'B' side, all shown here in MTL artwork. 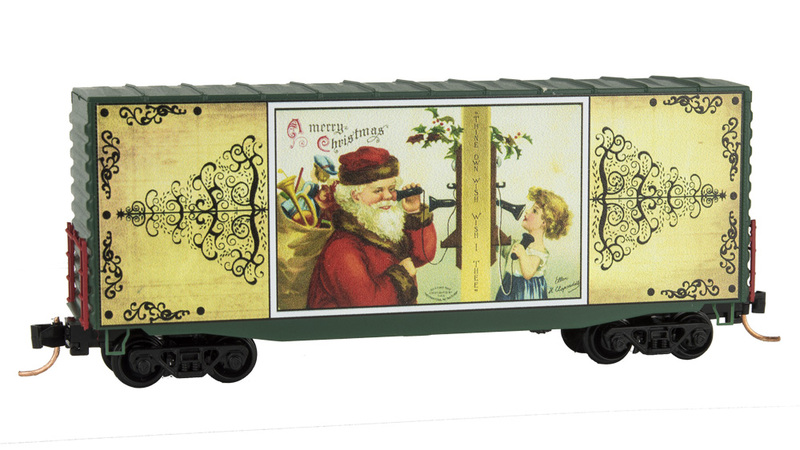 MTL Catalog Number 102 00 110, Micro-Trains "Christmas Carol". And the MTL 102 body style returned for a new theme which included the Micro-Mouse: a scene in which he and his family appeared. The Z Scale car (548 00 070, $23.95) used the same general design on a 50 Foot Mechanical Refrigerator Car. In 2016, Micro-Trains released the final three cars in the "Vintage Postcard" series. MTL Catalog Number 101 00 817, Postcard Series #7 "Santa's Visit". MTL Catalog Number 101 00 818, Postcard Series #8 "Rooftop Delivery". MTL Catalog Number 101 00 819, Postcard Series #9 "Magical Greeting". MTL Catalog Number 101 00 803, Custom Postcard. 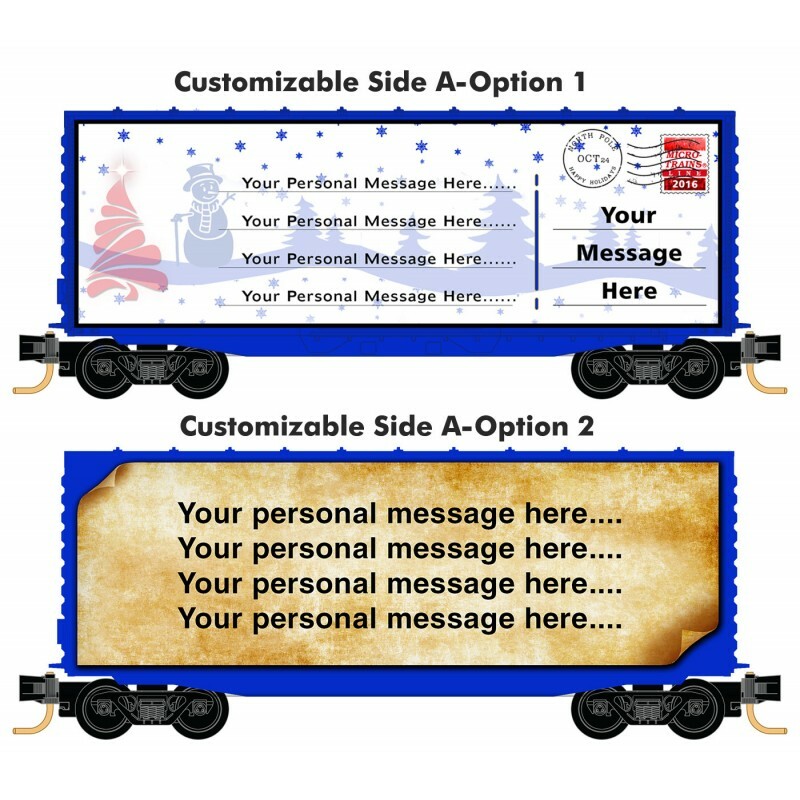 MTL also issued a third Custom Christmas Car, this time with a choice of two scenes for the 'B' side and two lettering schemes for the custom message on the 'A' side. 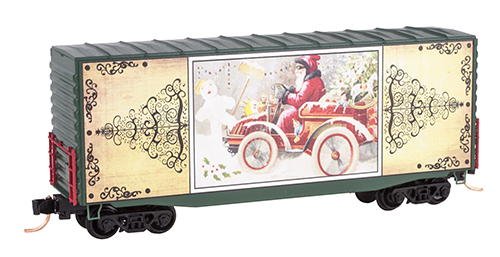 MTL Catalog Number 102 00 120, Micro-Trains 2016 Christmas Car. 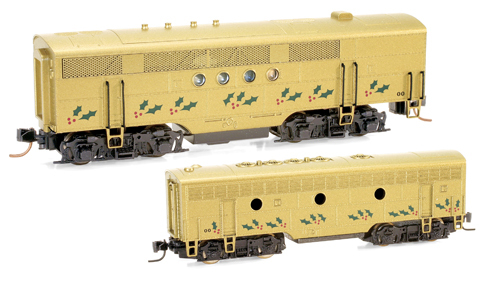 For the single Christmas Car, Micro-Trains went back to their 60 foot N Scale boxcar and 50 foot Z Scale Mechanical Refrigerator (548 00 080, $26.95). This time, the Micro-Mouse family was seen inside a cozy living room. I wonder what scale the model trains are? MTL Catalog Number 102 00 130/548 00 090 Micro-Trains 2017 Christmas Car. For 2017, there was just one car... ah, a return to those simpler years when there was just a single commemorative release. (You'll note that I have not tried to tackle the various Train Sets MTL has done over the years!!!) However, this car also included two different scenes: first, the Micro-Family finding the perfect Christmas Tree made for them... of cheese, of course! And then, bringing it home. 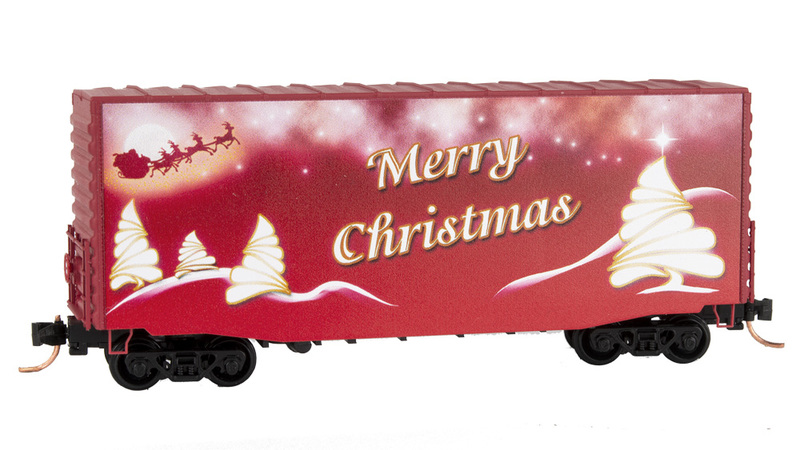 MTL Catalog Number 102 00 140 / 548 00 120, Micro-Trains 2018 Christmas Car. For 2018, the "Humbug" returned to wreak havoc on the Micro-Mouse's holiday decorations! As in 2017, this car also included two different scenes... let us say, "before" and "after." MTL Catalog Number 101 00 804, Custom Postcard. Original Price: $39.95, Released November 2018. After skipping 2017, MTL returned with a fourth Custom Christmas Postcard Car. Note that I refer to the side with the message as the "B" side while MTL calls it the "A" side.